Every once in a while you come across a book that is good for your soul, steering you back onto a course you hadn’t yet become aware you had left. I’ve had the good fortune of reading two of those in the past couple months. The first was Pure Scum by Mike Sares (you can read my review of it here), and the second was The Pastor by Eugene Peterson. 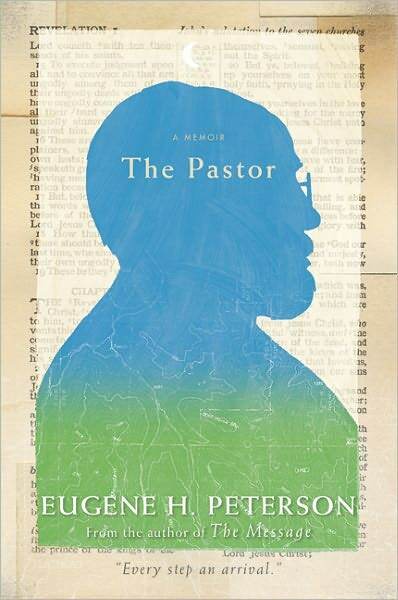 The Pastor is a memoir, the bulk of which is taken up with Peterson’s life before he moved to Vancouver. It is filled with stories of his childhood in Montana and his church-planting days in the Baltimore area. Peterson’s pastoral reflections are priceless, and should be read by everyone in the ministry. It’s difficult to review a memoir. They’re his stories. It was his life. What I want to write about, then, is how his book impacted me on a personal level. Peterson has taught me that none of that matters. It’s all a trap. His church never grew past a few hundred–paltry numbers in today’s megachurch climate. His words to a friend seeking significance through church size hit me like a ton of bricks: “The church you want and expect is the enemy of the church you are being given.” If you’re a pastor or in the ministry, you need to read that sentence again. Write it down, hang it on your door. Put it on your computer desktop. Here, let me type it bigger and bolder so you can read it better. The church you want and expect is the enemy of the church you are being given. Is it sinking in yet? God is giving and has given you a church, a congregation, a flock. (Not, by the way, an audience. God never gives you an audience.) But you are discontent with your church. You lust for more attendees, more resources, a wider appeal, a broader reach, more recognition, more fame, a book contract, a speaking circuit… The list goes on and on. But God doesn’t care about your selfish lusts, and he certainly doesn’t owe you anything. The church you want and expect is the enemy of the church you are being given. Embrace the church God has given you. Embrace the people under your spiritual care. Be their shepherd.